This one almost has me at a loss of words, which is pretty bad considering I usually have at least 2 cents to weigh in on these type of debacles. We all remember the Jena 6 right? If you happened to sleep through 2007, or your memory is a little hazy, the Jena 6 were 6 young black male high school students in Jena, Louisiana who beat up a white high school student in the midst of racial tensions at the high school stemming from a noose which was hung from a tree in the courtyard of the school. The white prosecutor, Reed Walters, initially charged the black students with attempted second degree murder, citing the students' tennis shoes as "dangerous weapons." He also attempted to charge the boys as adults, although the judge later denied that move. Meanwhile, the black public defender effectively walked the boys down the aisle and failed to call so much as a single defense witness on their behalf. The Michael Baisden show heard about the case and brought it into the public spotlight, which in turn, attracted America's favorite Poverty Pimps, Al Sharpton and Rev. Jesse Jackson Sr, who assumed their natural positions in front of the cameras on every possible photo op. They were even so gracious as to allow the actual Jena 6 students to get in a few. So now you remember the case right? Right. So what ever happened to those 6 guys after all the TV crews, news media, and civil rights "leaders" packed up all their stuff and left? Well the charges against Carwin Jones, Theo Shaw, Bryant Purvis, and Robert Bailey Jr. were all reduced to aggravated second-degree battery and the trial has yet to take place for those charges. Jesse Rae Beard was placed on house arrest. Michael Bell, who was the main point of interest for the prosecutor, was eventually tried as a juvenile for battery and placed on probation. Bell then violated his probation and was returned to custody of the state. He later plead guilty to battery and was credited with time served. Normally, this would be the end of the story. Common sense dictates that after you narrowly escape getting hit by the train, you usually don't get back on the tracks. But that would be too easy. Can't get right strikes again. On Christmas Eve, Michael Bell, yes that Michael Bell, was caught and arrested for shoplifting from Dillards, resisting arrest, and simple assault. Then, a few days later he shot himself in the chest with a .22 caliber pistol. He was either trying to clean the gun and it went off, or he was trying to take his own life. In either case, the young man is clearly in need of some guidance. 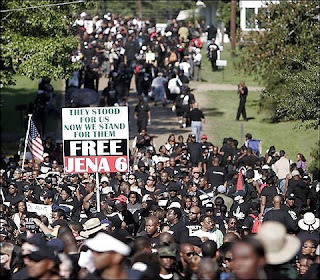 ...when all the people in the above featured pic saw fit to march on Jena, Louisiana, what were they really marching for? To help fight injustice against 6 young black men, or was it simply to be seen on TV? Because if it was the former, then how is it that Michael Bell is even in a position today to be shoplifting in the first place??? At no point did any of the 1000's that descended upon Jena ever take a moment to think to themselves that maybe, just maybe, these young brothers needed some mentoring more than they needed TV exposure? Michael Bell had a criminal record long before the Jena 6 incident. Be it from a parent, a high school teacher, a coach, a neighbor, a family member, whatever...there needed to be some intervention long before it escalated to the level where the Jena 6 became a household name. Don't get me wrong, we have to call out injustice whenever and wherever it rears its ugly head, and the prosecutor in this case should have been brought before the bar to have his license removed for even bringing the initial charges of attempted second degree murder with a straight face. Attempted murder? With a shoe? Give me a break. Two times. But I'm not giving Al or Jesse a pass on this one. I guess taking a photo op is a lot easier than actually volunteering for say, an Upward Bound program or something that would actually effect the lives of our young people in the black community. The Oath: Is Barack Obama Really the President?